Developers have moved electrical units from the basements to rooftops of buildings in the Seaport District along Boston Harbor. While little action is expected from Congress on climate change, many businesses in Boston and beyond are taking matters into their own hands, preparing for a warmer world in which severe weather, rising sea levels, and increased flooding threaten property, operations, and earnings. 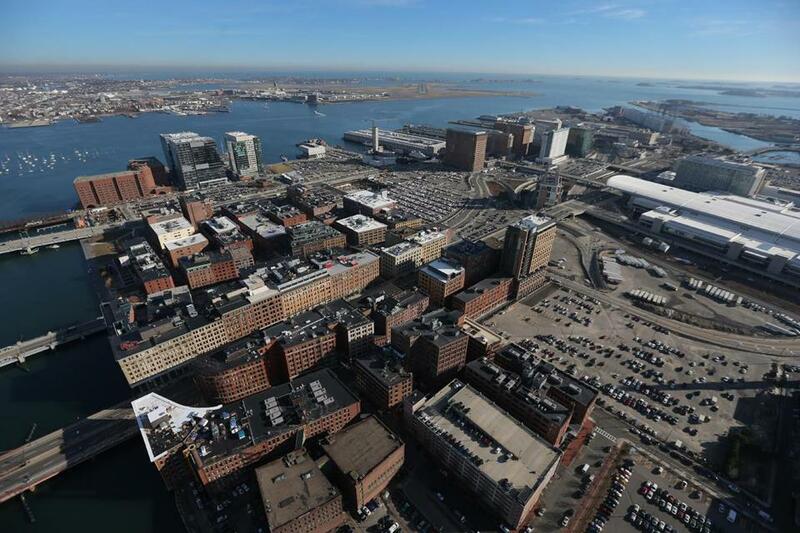 Developers have moved electrical units from the basements to rooftops of buildings in the Seaport District along Boston Harbor. Utilities in New England have elevated substations several feet above the ground and replaced wooden electrical poles with steel ones that can withstand powerful winds. Insurance companies, in response to clients, are testing products designed to protect against varied effects of climate change, and providing more coverage against natural disasters. The Hartford insurance company now offers small businesses policies against losses due to widespread power outages, a growing concern as major storms occur more frequently. Recent evidence has added to these worries. Earlier this month, a federal study warned that the climate in the United States was changing at a faster pace due to the burning of fossil fuels — such as oil, coal, and natural gas — that emit greenhouse gases blamed for rising global temperatures. That has resulted in longer droughts and more wildfires in the West, stronger hurricanes in the South, and degraded air quality in the Midwest, the study by a panel of scientists concluded. The Northeast, the study found, would be particularly hard hit as climate change accelerates, baked by heat waves and flooded by rising sea levels and torrential downpours. FM Global, a commercial insurance company based in Rhode Island, is receiving more requests from its clients for climate-related risk analysis and quotes for flood and drought protection, the company said. Businesses are increasingly worried that severe weather could delay shipments or flood buildings, such as data centers that contain expensive equipment and even more valuable corporate and customer information, said Lou Gritzo, a vice president and manager of research for FM Global. The number of FM Global engineers studying flood issues will soon grow to 15, more than triple the number five years ago. The researchers are doing significantly more testing of flood barriers and other products aimed at keeping water out of doorways and parking lots to determine their effectiveness, with the idea of offering business clients discounts for using the approaches that work. Before Hurricane Sandy battered the East Coast in 2012, FM Global tested two flood mitigation products per year. Last year, it tested 27, Gritzo said. In the Southwest and West, Gritzo said, businesses face the opposite problem: water shortages, which scientists say will become more acute as temperatures rise. FM Global is testing fire sprinkler systems that consume less water by misting instead of dousing the flames. The company is also looking at ways to recycle water use to conduct regular and necessary tests of sprinkler systems to protect against fire. Insurers, too, are concerned about hurricanes, tornadoes, and wildfires occurring more frequently. Three of the top six years for catastrophic insured losses have occurred since 2005 with a combined $142 billion in expenses, according to the Insurance Information Institute, an industry research group that has tracked the costs since 1989. Data about climate, which was primarily used by federal agencies and insurance companies in the past, is now sought by all types of businesses and organizations, from health care providers to banks to manufacturers, said Kyle Beatty, the president of Verisk Climate. Verisk, headquartered in New Jersey, bought a Lexington climate research firm six years ago in anticipation of growing demand for climate information. A retailer may want to know the likelihood of major storms downing power lines and triggering blackouts that would close stores, Beatty said. A manufacturer might want to diversify suppliers if a particular contractor is in a flood-prone region. “The business reaction is to the fact that they’re experiencing impacts to their operations and earnings that they haven’t in the past, they need strategies to address that,” Beatty said. While corporations are adapting their businesses to more severe weather threats, many have been criticized by environmentalists for doing too little to curb activities that contribute to climate activities. A global survey of business executives in December by the MIT Sloan Management Review found that fewer than half said their companies were taking such steps as improving energy efficiency or cutting pollution to reduce greenhouse gas emissions. Smaller businesses remain unprepared for a changing climate, said Cynthia McHale, director of insurance programs at Ceres, a Boston-based coalition of investors and environmentalists. Many still don’t have the necessary insurance to cover all the potential losses, such as business interruption coverage that can cost hundreds to thousands of dollars. Getting more information to these companies so they better understand the threat can help, McHale said, but businesses alone can’t prepare for the effects of climate change. If coastlines are going to shift and streets turn into canals, governments must be ready to invest in measures such as elevating roadways, building seawalls, and placing utilities underground.